By the 1770s the Brandywine mills featured prominently in travel accounts as “must-see” destinations. Their round-the-clock operation contributed to the growth of a symbiotic industrial town, Brandywine Village, which provided a ready supply of skilled workers such as coopers, millwrights, and ship captains. 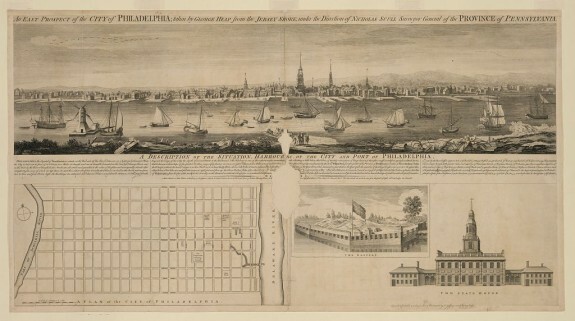 The bustling Philadelphia port on the Delaware River was the main center of trade and commerce in the area. Here merchant ships flow up and down the Delaware loading and unloading on the shores. Notice in the left corner a floating windmill further emphasizing the important of the flour trade. The windmill seen here may be a symbol for Windmill Island or an actual windmill moored to the shoreline. This advertisement demonstrates the massive growth in the Philadelphia area flour industry. 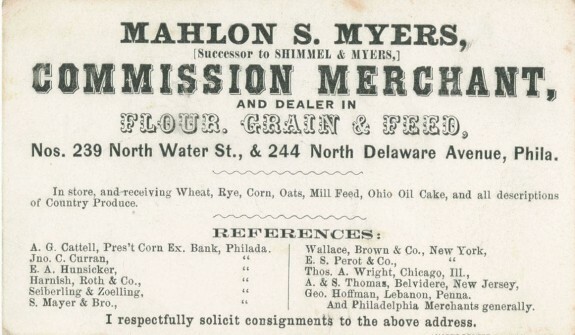 Notice that Mahlon Myers is able to deal in flour and grains without participating in farming, milling, or baking. This type of specialization in the workforce is often seen in times of great prosperity and it further illustrates the vast amount of flour produced and traded in the Philadelphia area. Roberts’ grist mill, built by Richard Townsend in 1683 and demolished in 1873, is considered to have been oldest grist mill in Pennsylvania. Townsend built one other mill, commissioned by William Penn. Penn tried to corner the public market on grist milling, which indicates how lucrative he believed it to be. 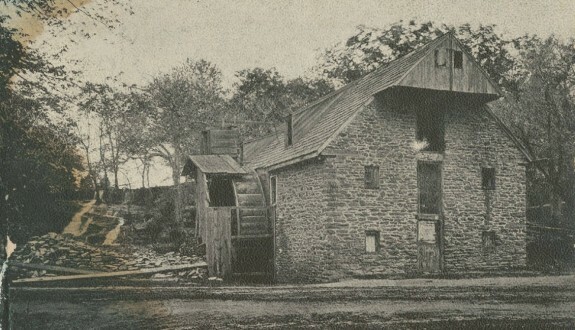 In his reminiscences, Townsend noted that early Pennsylvanians did not have horses and hauled grain on their backs to mills such as this one. 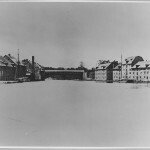 In this image, the water wheel is clearly visible on the outside of the mill. That would not be common of later mills, most were built with indoor wheels. Cooling flour before it met the sifters was a problem in the Philadelphia flour trade. Often time flour, warm and moist from the friction of the grinding stones, would clog sifters. Flour, still too warm and wet, that passed through the sifters and into barrels would turn rancid before it could be delivered to the customer. Oliver Evans’ invention of the “hopper boy,” seen to the left, revolutionized the way flour was sifted and packed. 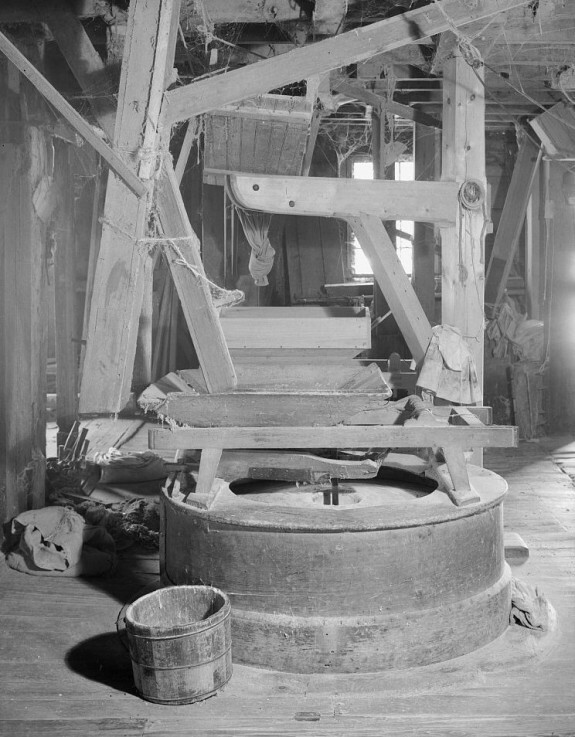 Evans’ system involved bucket elevators (figure four in the image left) that carry wheat and flour between different floors of the mill to a mechanized rake called a “hopper boy.” The hopper boy cooled the flour before it was delivered to the sifters. Carrying grain to different floors is job that had been traditionally done by men. 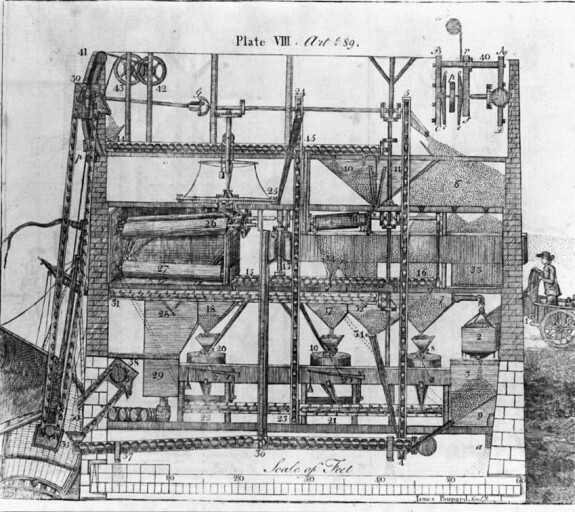 Thus Evans is credited with inventing one of the first automated systems in the United States. 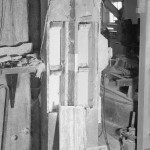 Seen in the image left is the inner workings of the Greenbank Mill in New Castle County, Delaware. 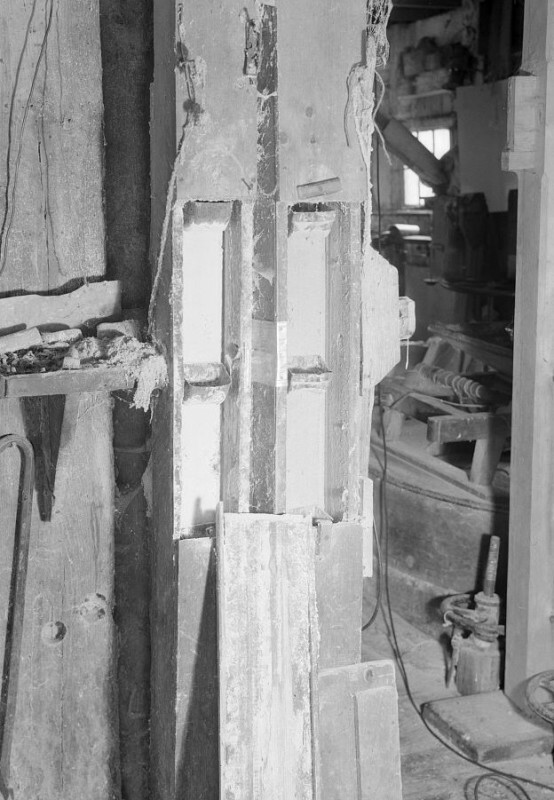 More specifically at the center of the image is a pair or “run” of millstones encased in ‘furniture,” or an assemblage of parts that regulate the flow of grain between the stones. Parts of the furniture are identifiable in this image. For instance the hopper is the large bin that at one point held grain; the shoe is the inclined part below the hopper which would have fed the grain into the eye of the stone; the damsel is the vertical rod and it tapped the grain into the eye; the horse, which is the wooden framework supporting all of the above; and the hoop or skirt which wraps around the stones and feeds the ground flour into a bin below the floor. Invented by Oliver Evans, the bucket elevators shown at left accelerated the rate at which grain could be processed into flour by mechanizing the hard labor of carrying grain through the mill traditionally done by men. As early as the 1650s, industrious farmers produced enough wheat not only to sustain themselves but also to send a surplus to market. For farmers in the city’s hinterland, the center of any rural community was the “custom” grist mill. More than just a place where farmers took their product for grinding, the mill was where they learned news, met with friends, and transacted business. These custom mills serviced a geographic radius of five to ten miles—the distance a farmer could travel with a wagon in one day. Custom mills were small, typically one or two stories, and the miller extracted payment by taking a “toll,” or a portion of the product. This he could keep for his own use or sell. 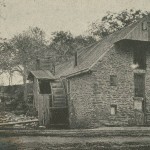 Unlike the grist mills of New England and the South, most Delaware Valley mills were powered by indoor water wheels, an innovation unique to this area. Moving the wheel inside helped prevent it from icing in the winter, and the miller could work nearly year-round. As demand for Pennsylvania flour increased, larger merchant mills appeared. Merchant mills differed from custom mills in that they purchased unprocessed wheat seeds from the farmers and sold the rendered flour at market themselves or through agents. The most famous of these merchant milling centers developed on the banks of the Brandywine River, where shallops (ships slightly smaller than sloops) were loaded directly at the mill with up to two hundred barrels of flour at a time for shipping to Philadelphia. By the 1770s the Brandywine mills featured prominently in travel accounts as “must-see” destinations. Their round-the-clock operation contributed to the growth of a symbiotic industrial town, Brandywine Village, which provided a ready supply of skilled workers such as coopers, millwrights, and ship captains. The difficulty and expense of transporting wheat from western farms to eastern markets, often over roads plagued with potholes and muddy quagmires, led to the incorporation of the first paved turnpikes and turned the simple business of transportation into a potentially lucrative venture. The importance of flour to Philadelphia was further demonstrated by the city’s preoccupation with protecting its dominance in the market. After decades of competing with New York and Baltimore, during which time Philadelphia flour developed the reputation of being lower quality than that of its neighbors, the city passed the first comprehensive flour inspection act in 1722. This act stipulated that flour intended for export meet a set standard for quality and be packed in barrels branded with the registered mark of the miller. Millers who improperly classified the quality of their flour or who were caught tampering with weights paid severe penalties. These laws, among the first of their kind in the British colonies, enabled Philadelphia’s flour exports to increase sevenfold from the 1730s to the early 1770s. This commitment to quality, paired with a series of poor harvests in Europe, soon made the Delaware Valley the breadbasket of the world. A further boon was the work of inventor Oliver Evans (1755-1819). Evans was born in Newport, near Wilmington, Delaware, already famous for its Brandywine River mills. Prior to his inventions, a grist mill required four or five workmen to keep the machines running smoothly and the wheat and flour flowing. The system often bogged down when it came time to sift the flour, which was warm and moist from the friction of the stones. Moist flour clogged the sifters, and warm flour packed before it cooled could turn rancid before it reached its consumers. Evans invented a system by which bucket elevators did the work of men to carry wheat and flour between the different floors of a mill, and a mechanized rake called a “hopper boy” cooled the flour and delivered it to the sifting machines. 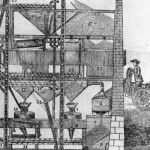 These innovations made flour milling perhaps the first automated industry in America, and on December 18, 1790, Evans received the third patent ever awarded by the United States government. The Delaware Valley continued to reign as the world’s foremost milling center until 1815. The steady decline after that time period can be attributed to a number of factors. First, Philadelphia’s flour merchants depended heavily on the trade of high-quality “superfine” flour to European markets. Improved harvests in Europe in the early part of the nineteenth century diminished demand for American wheat and flour, while at the same time the catastrophic invasion of the Hessian Fly, which first appeared on Long Island in 1777, destroyed wheat harvests in Pennsylvania, New Jersey, and Delaware. After consecutive years of loss, many farmers stopped planting wheat altogether and focused on corn, rye, and oats, which were fine for domestic use but had no market overseas. By 1860 railroads made possible the free flow of farmers and commerce to the open, fertile plains of the Midwest. Hard Midwestern wheat, higher in gluten content than softer Eastern wheat, could not be processed on millstones because of its tough hull. When “roller mill” technology emerged to process this desirable product, the giant new commercial mills on the Mississippi River won those sought-after contracts. Millers in the Delaware Valley were slow to refit their machines, and most saw no point in competing with Minneapolis, which after 1880 was simply known as “Mill City,” home to corporations like Pillsbury and Gold Medal Flour. For a century, Greater Philadelphia served as the powerhouse of the world’s flour economy. 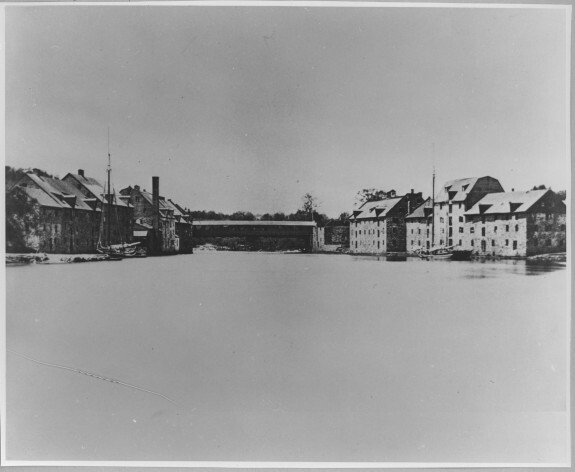 Even though the flour bubble burst after 1815, there existed enough of an industrial foundation that many of these mills and commercial centers successfully shifted to more marketable products. The Brandywine Valley’s world-famous grist mills converted to textiles, paper and gunpowder. Emerging industries took advantage of existing pools of skilled laborers and shippers, as well as one of the best transportation infrastructures in the country. All of these were built in large part on the back of the flour industry. Jennifer L. Green spent four years as the education and interpretation director at a historic grist mill in Chester County, Pa., and continues her work in the industrial history of the Greater Philadelphia area as Program Manager at the National Iron & Steel Heritage Museum in Coatesville, Pa.
Hunter, Brooke. Rage for Grain: Flour Milling in the Mid-Atlantic 1750-1815. PhD diss., University of Delaware, 2001. Kuhlmann, Charles B. The Development of the Flour-Milling Industry in the United States. Boston: Houghton Miffling Company, 1929. Lemon, James T. The Best Poor Man’s Country: A Geographical Study of Early Southeastern Pennsylvania. Baltimore: Johns Hopkins University Press, 1984. Storck, John and Walter Dorwin Teague. Flour for Man’s Bread: A History of Milling. Minneapolis: University of Minnesota Press, 1952. Hagley Research Reports (Manuscript Accession #1645), the Lea Mills Collection, and other collections, Hagley Library, 298 Buck Road, Wilmington, Del. 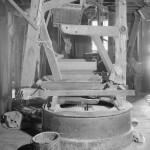 Society for the Preservation of Old Mills (SPOOM) Archives, Newlin Grist Mill, 219 South Cheyney Road, Glen Mills, Pa.
Hagley Museum and Library, 200 Hagley Creek Road, Wilmington, Del. The Mill at Anselma, 1730 Conestoga Road, Chester Springs, Pa.
Newlin Grist Mill, 219 S. Cheyney Road, Glen Mills, Pa.
back in 1967 we rented an apartment in evansberg, pa. in a grist mill…it was located on skipparck creek rd. just off germantown ave…right before you entered collegeville, pa….we stayed about a year and a half…..any or all information would be appreciated…it was our honeymoon and first home. 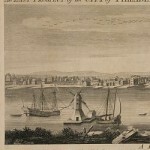 Wonderful article about Philadelphia’s early agricultural and food history! I’m trying to flesh out details about former owners of our farm on Bollinger Rd, West Nantmeal twp- Mathew and son John Robe(i)son-~1745-86- and wonder if you might have some access to historical records of farmers of that era. They seem to have been fairly prosperous and the son had a Tanyard on our property for a number of years. I have visited the ChesCo archives, etc and John did sign the articles of,association in 1778. Both were active in the Forks of the Brandywine Presbyterian Church.